Roof cleaning especially removing moss and lichen is one of the most important roof jobs for the long term survival of your roof. We are specialists at Moss and Lichen Cleaning with an ECO friendly product, for all areas from Birmingham to Cardiff. If your preference is to save water by not pressure cleaning then read on! Roof Cleaning will take care of it all. We can clean your roof by removing grime, roof moss and lichen using products that are safe for people, pets and plants. 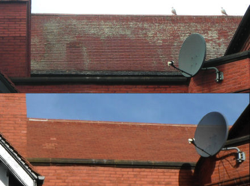 This roof cleaning process does not use harsh chemicals that are corrosive to your spoutings and can stain the exterior paintwork of your home. Moss and lichen growing on roofs and on old buildings is sometimes seen as conservation but the invasive nature of the root systems of this plant material can be very damaging to the roof and building fabric. Our application is low pressure therefore cleans and protects old clay or slate tiled roofs without causing any physical damage. We have put a great deal of thought into how best to apply our products and we don't even have to walk on your roof. 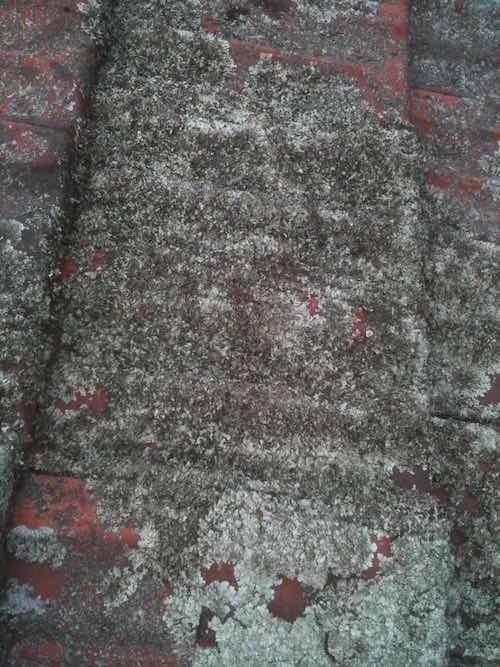 If your roof is covered in grime, moss and lichen it can ruin the street appeal of your property. Roof cleaning must be one of the smartest things you as a homeowner can do to protect your investment. So in the end your roof looks great and a well maintained home reflects well on you the owner. We use eco friendly bio degradable products to remove your roof moss and lichen. This means that all the products we use are kind to the environment, your pets, and your home and specially formulated for lichen, moss and dirt removal. Our products are slow acting so keep on working for 2-3 years. We DO NOT use harsh chemicals that can damage your gutters, downpipes and flashings increasing the rate of corrosion. 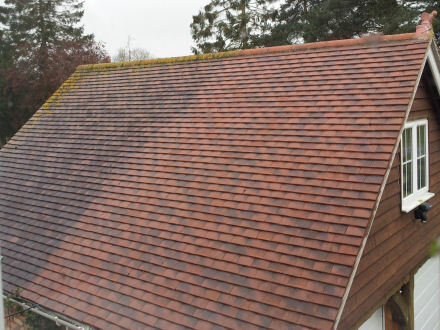 Traditional high pressure roof cleaning uses a lot of water to clean the moss and lichen in one go on an average roof, even then it can leave bits of it behind, and there is a huge risk of damage from foot traffic or just the fierce pressure cleaner. We only use about 100 litres on an average house. We feel that using high volumes of water is a waste of a precious resource. Let our product and nature working together take their time and do the job for you gradually and more thoroughly. Roof Cleaning and all about why it should be sorted out. Numerous property holders are exceptionally worried about the cleanliness of their homes and they really work hard to clean inside including backyard and garden ensuring they are kept in flawless condition. It really is very easy to overlook the most critical piece of your home that is the roof surface. Most roof surfaces including all types of tiles have evidence of complete disregard and absence of care. There are great reasons why each home owner ought to get worried about having a dilapidated rooftop. Most importantly, note that the top of your home is the thing that individuals see even before they get inside and a grimy roof is not engaging by any stretch of the imagination. A cared for roof will give your home many years of trouble free life, protecting valuable roof timbers. This is particularly essential in the event that you choose to offer it for sale some time or another in future. A straightforward approach to keep up a spotless roof using an eco friendly product, is the reason you ought to contribute a minimal expenditure to guarantee that it is done well at the first attempt. Soft wash low pressure is used in order to remove any buildup, green growth, parasites or grime that could have amassed on any solid surface and roofing. Maybe you have seen a few roofs that are constantly soggy and sodden. This is a problem, and is a major issue for individuals who live in regions that are wet or sodden for a large part of the year. At the point when this dampness is left to stay on the rooftop for quite a while, it starts to breed green growth, mould, and organisms which can without much of a stretch obliterate the rooftop when not killed off as soon as is practically possible. 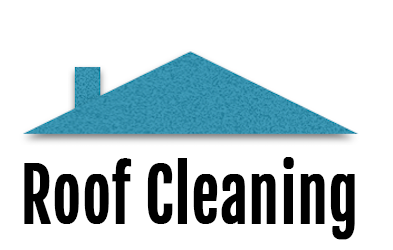 Rooftop soft wash cleaning is the most ideal approach to expel this undesirable grime from your house roof to give at the wonderful look you have constantly imagined about. There are numerous great reasons why rooftop cleaning ought to be viewed as a vital rooftop support movement by any home holder. You need to recall that you have spent a considerable measure of cash purchasing or building this home and you have to secure your venture no matter what. When you choose to offer this home in future, you can make sure that you avoid a damaged roof.